Hei, puta ble veldig fin. Stilige farger. Ser fram til å se mønster? Har du fått hekla noen blomster, Tåvs? What a great idea. All of us have those extra, what to do with scraps of yarn. These would take up a lot of them. Just an idea for you and holidays, make your pillow covers in the different colors for the different holidays. For example, orange/black for halloween, pinks/red for valentines etc. Thanks for sharing this sweet pattern. this is so incredible pretty! 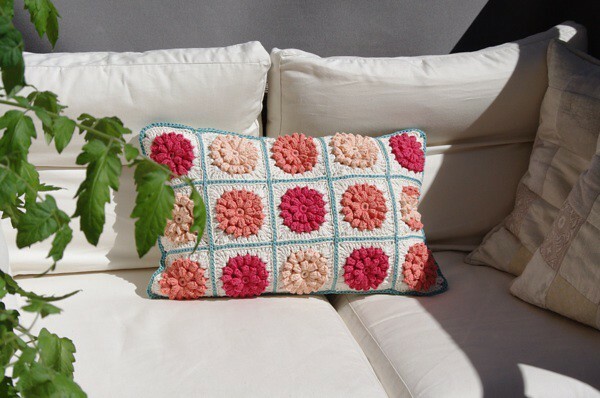 It’s surely you who made the dahlia-throw in the newest Crochet Today issue?! The flower looks exactley like these above, only the “frame” is made a little bit different. Did not see the Crochet Today pattern, but it’s not an uncommon stitch for a flower, I think 🙂 Thanks for the tip, anyway, I have to check it out now…! I love this one! Do you remember the brand names/colours of yarn you used? Thanks!